Why are we gathered here? 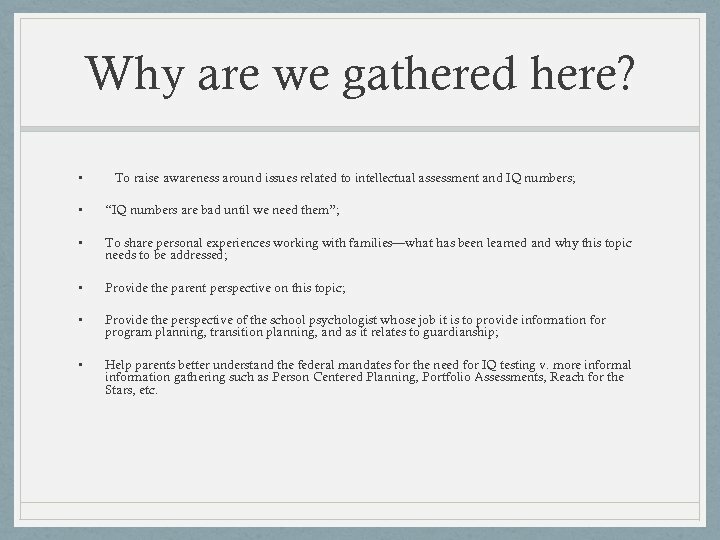 • To raise awareness around issues related to intellectual assessment and IQ numbers; • “IQ numbers are bad until we need them”; • To share personal experiences working with families—what has been learned and why this topic needs to be addressed; • Provide the parent perspective on this topic; • Provide the perspective of the school psychologist whose job it is to provide information for program planning, transition planning, and as it relates to guardianship; • Help parents better understand the federal mandates for the need for IQ testing v. more informal information gathering such as Person Centered Planning, Portfolio Assessments, Reach for the Stars, etc. Some background…. My job: I am a School Psychologist…. That said, let’s talk about the. . . dun dunnnnn…. . The triennial evaluation (pretty much the reason for my job) …Words that can strike fear into the hearts of the hardiest of parents. 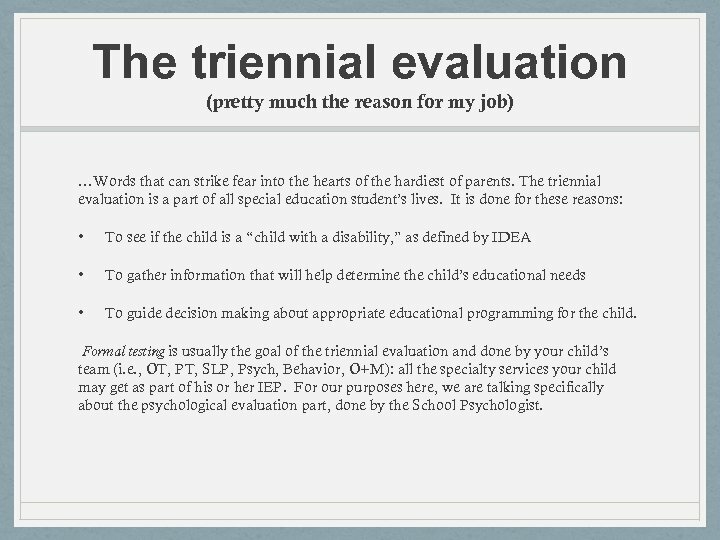 The triennial evaluation is a part of all special education student’s lives. It is done for these reasons: • To see if the child is a “child with a disability, ” as defined by IDEA • To gather information that will help determine the child’s educational needs • To guide decision making about appropriate educational programming for the child. 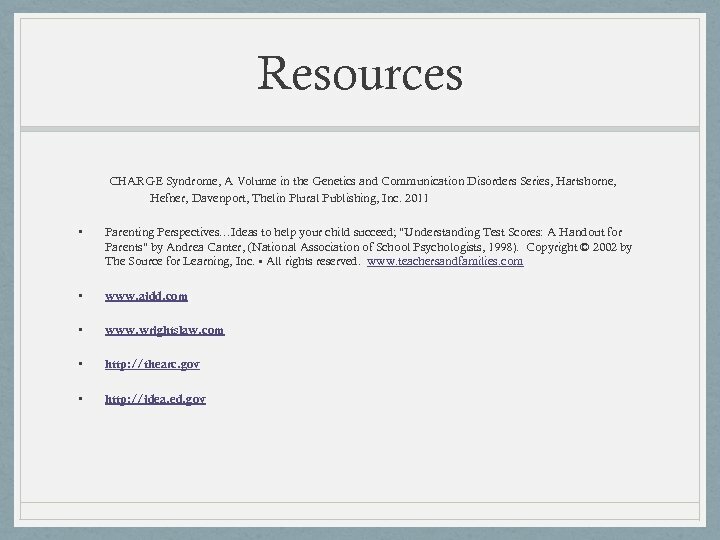 Formal testing is usually the goal of the triennial evaluation and done by your child’s team (i. e. , OT, PT, SLP, Psych, Behavior, O+M): all the specialty services your child may get as part of his or her IEP. 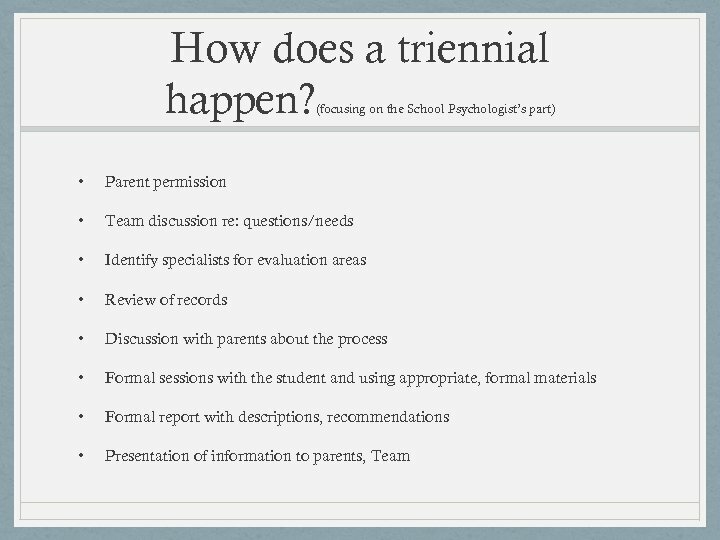 For our purposes here, we are talking specifically about the psychological evaluation part, done by the School Psychologist. 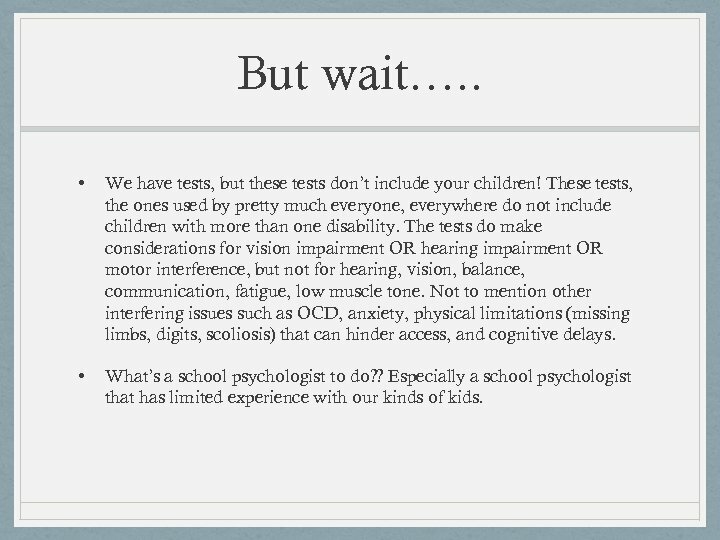 But wait…. . • We have tests, but these tests don’t include your children! 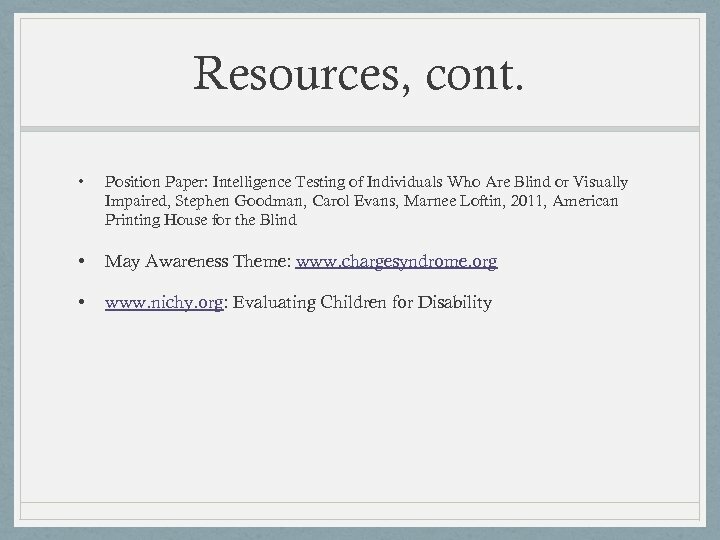 These tests, the ones used by pretty much everyone, everywhere do not include children with more than one disability. The tests do make considerations for vision impairment OR hearing impairment OR motor interference, but not for hearing, vision, balance, communication, fatigue, low muscle tone. Not to mention other interfering issues such as OCD, anxiety, physical limitations (missing limbs, digits, scoliosis) that can hinder access, and cognitive delays. 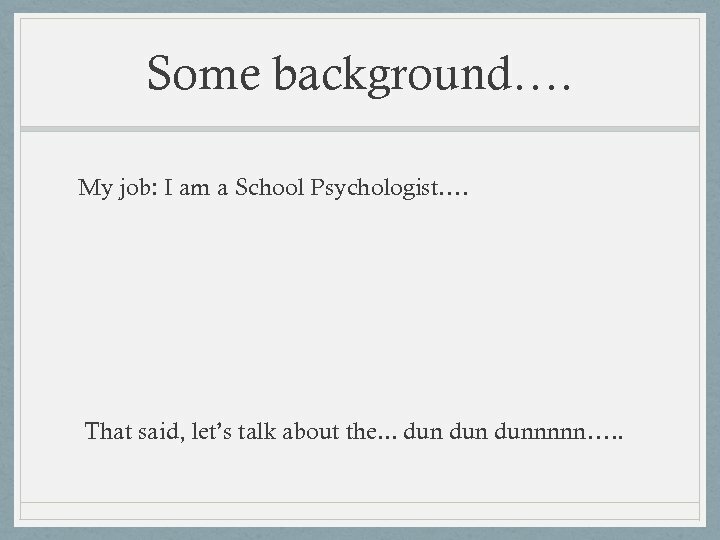 • What’s a school psychologist to do? ? Especially a school psychologist that has limited experience with our kinds of kids. So, I. Q. : What is it and how do we find it? 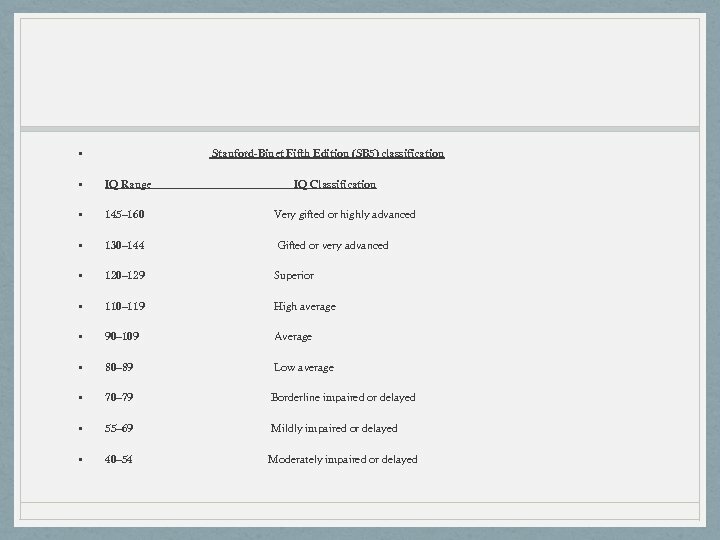 • I. Q. is an abbreviation for the term, Intelligence Quotient. 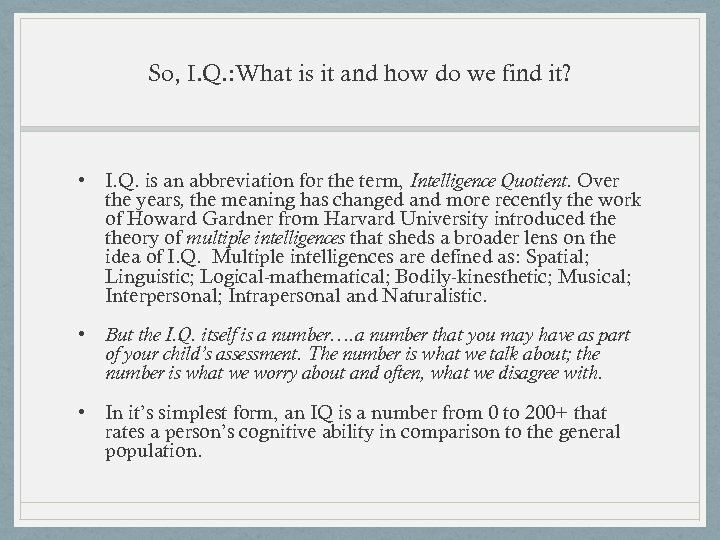 Over the years, the meaning has changed and more recently the work of Howard Gardner from Harvard University introduced theory of multiple intelligences that sheds a broader lens on the idea of I. Q. Multiple intelligences are defined as: Spatial; Linguistic; Logical-mathematical; Bodily-kinesthetic; Musical; Interpersonal; Intrapersonal and Naturalistic. • But the I. Q. itself is a number…. a number that you may have as part of your child’s assessment. The number is what we talk about; the number is what we worry about and often, what we disagree with. 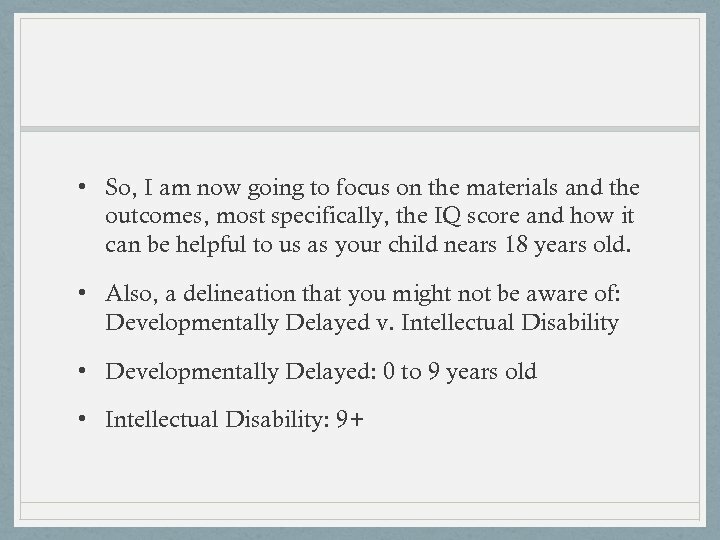 • In it’s simplest form, an IQ is a number from 0 to 200+ that rates a person’s cognitive ability in comparison to the general population. 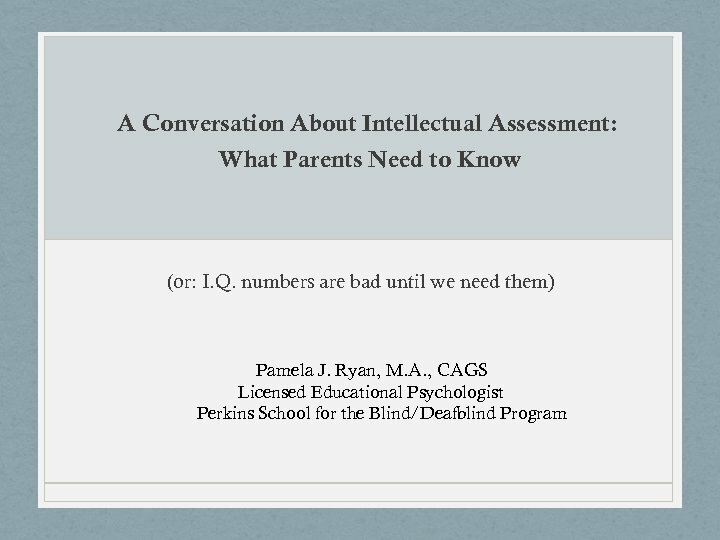 • But those things---those numbers--- are not what you really want to hear about when your child’s triennial assessment is reported on at the IEP (or a separate meeting). • You want to hear the things that make your child stand out and at the very least, you want to know that the evaluator KNOWS your child. 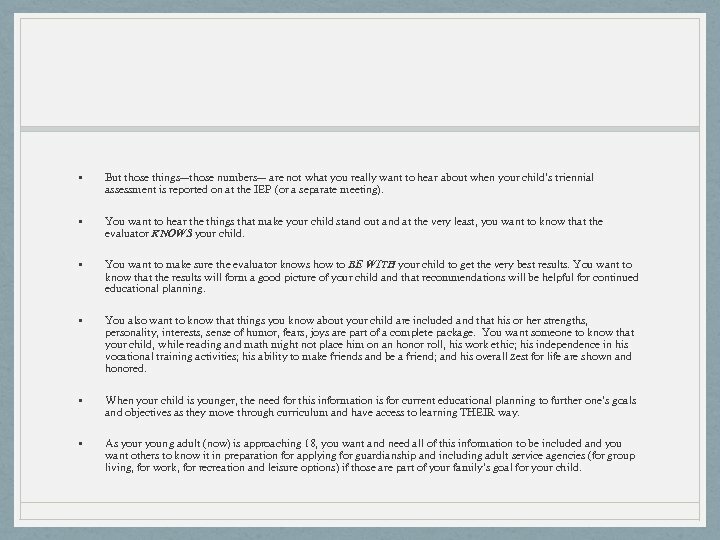 • You want to make sure the evaluator knows how to BE WITH your child to get the very best results. You want to know that the results will form a good picture of your child and that recommendations will be helpful for continued educational planning. • You also want to know that things you know about your child are included and that his or her strengths, personality, interests, sense of humor, fears, joys are part of a complete package. You want someone to know that your child, while reading and math might not place him on an honor roll, his work ethic; his independence in his vocational training activities; his ability to make friends and be a friend; and his overall zest for life are shown and honored. 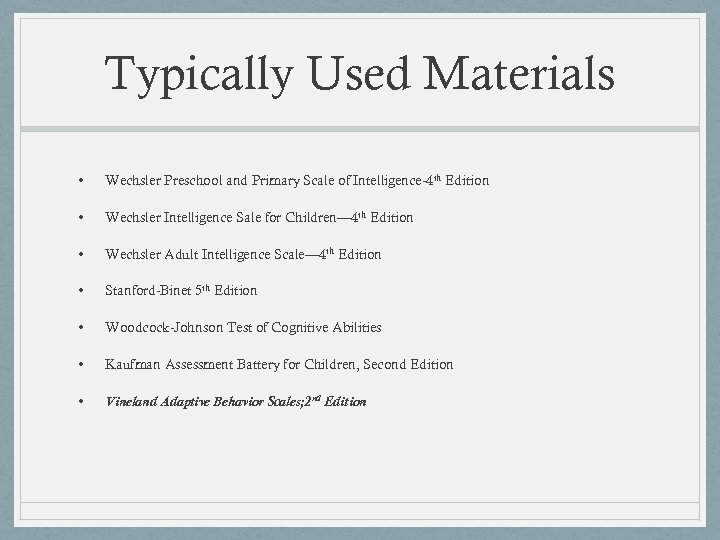 • When your child is younger, the need for this information is for current educational planning to further one’s goals and objectives as they move through curriculum and have access to learning THEIR way. • As your young adult (now) is approaching 18, you want and need all of this information to be included and you want others to know it in preparation for applying for guardianship and including adult service agencies (for group living, for work, for recreation and leisure options) if those are part of your family’s goal for your child. In addition to the numbers…. 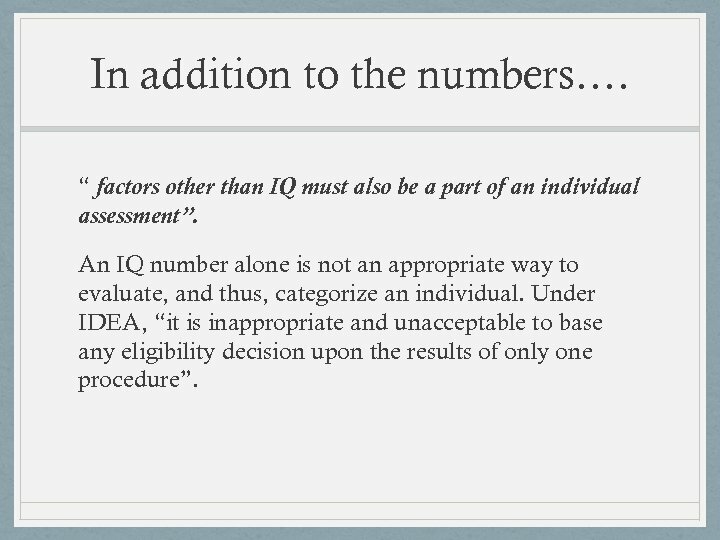 “ factors other than IQ must also be a part of an individual assessment”. 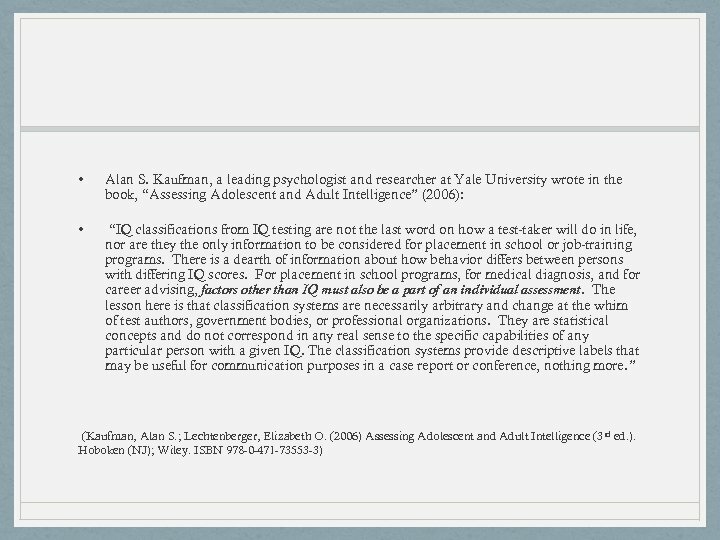 An IQ number alone is not an appropriate way to evaluate, and thus, categorize an individual. Under IDEA, “it is inappropriate and unacceptable to base any eligibility decision upon the results of only one procedure”. 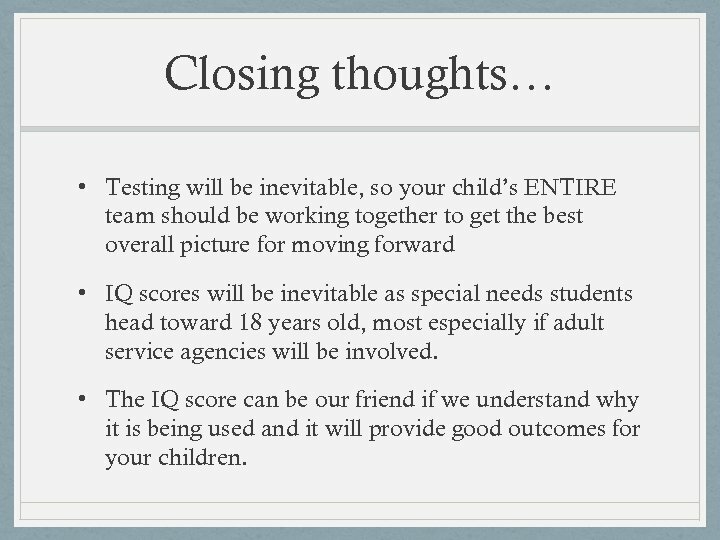 Closing thoughts… • Testing will be inevitable, so your child’s ENTIRE team should be working together to get the best overall picture for moving forward • IQ scores will be inevitable as special needs students head toward 18 years old, most especially if adult service agencies will be involved. 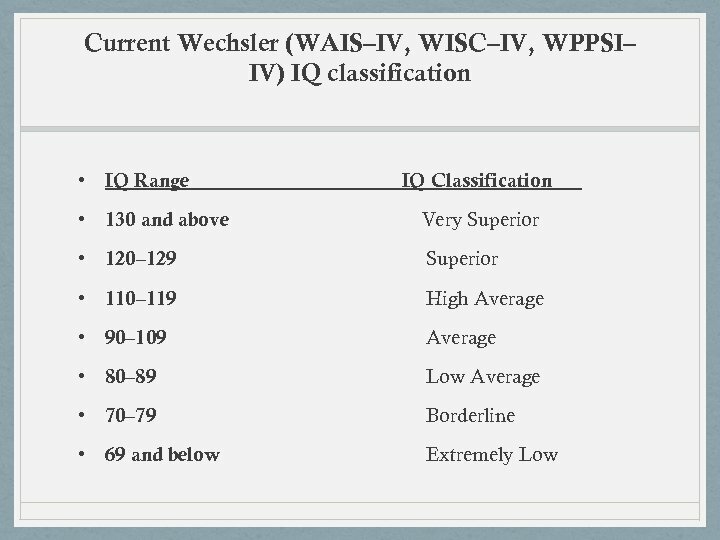 • The IQ score can be our friend if we understand why it is being used and it will provide good outcomes for your children.